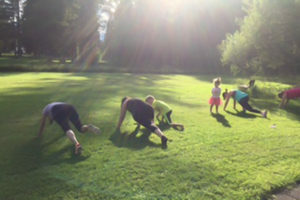 GARMISCH, Germany — Two New Parent Support Programs, coordinated by Army Community Service’s Kara Tobin, connect family members in Garmisch this summer. Both programs offer an opportunity for fitness, fresh air and chatting with other parents. The Playground Pump group meets at one of the playgrounds in the housing area Tuesday from 5:30-6:15 p.m. The idea came from a mom who missed workouts if child care wasn’t available. Why not combine a workout for moms with play-time for the kids? Kayla Wait, a certified Athletics and Fitness Association of America, or AFAA, group fitness volunteer teaches 45-minute circuit trainings while kids play with their new friends. It’s a great way for both moms and kids to be outside having fun. Evening classes will end next week, but morning classes will be scheduled once school gets back up-and-running. On Friday mornings from 9:30-10:45 a.m., interested parents meet with Tobin for leisure stroller-friendly walks in the area. The group discusses hot parenting tips while enjoying fresh air. It’s a great way for parents with younger children to network with other parents. Parenting toddlers can be challenging, especially for new parents stationed outside their country, said Tobin. But these programs are designed to give them the support they need. For more on New Parent Support Programs, contact ACS at DSN 440-3777, 08821-750-3777.